My kids don’t get much screen time but I do allow some computer time each day. Tiger was very excited to have his very own computer program to work on by himself during his computer time. We were excited to review Time4Learning! 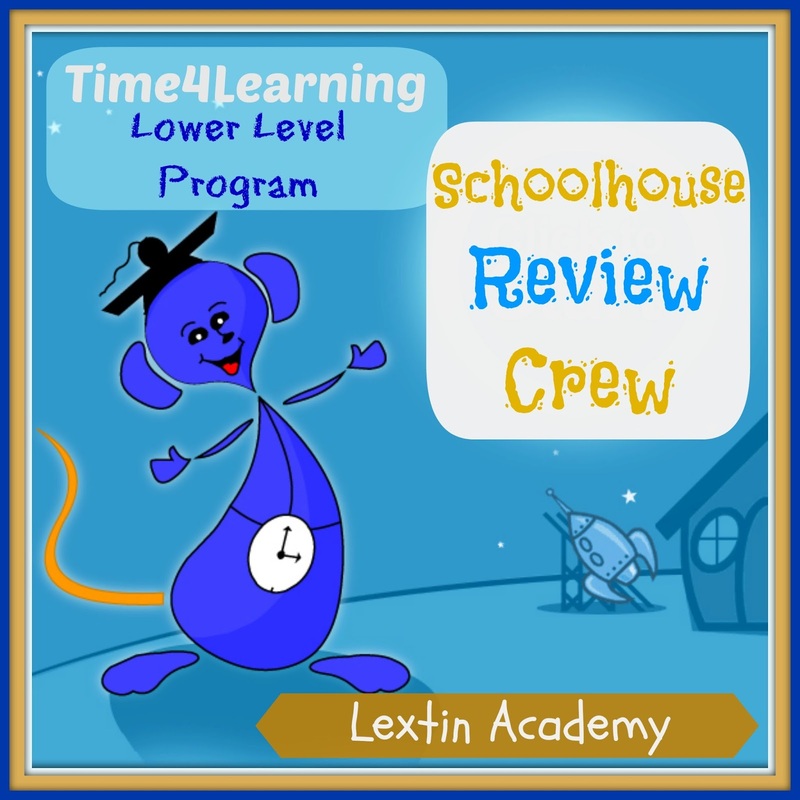 Time4Learning is a complete curriculum for PreK through 12th grade students and can be used as a stand alone curriculum, for summer enrichment, or to supplement and provide extra practice in addition to another curriculum. This program is completely online and teaches through interactive lessons and videos while also providing supporting worksheets. A student has access to their current grade level materials as well as the courses for 1 grade level below them and 1 grade level above them. This meant that Tiger was placed in the K level since this is his Kindergarten year. However, he had access to both the PreK courses and the 1st grade courses. This allows you to place your student in the proper grade level even if it varies by subject. This works well for kids who are behind in only one area or accelerated in one subject. You can adjust the program to fit their needs accordingly. For the PreK-8th program the price is $19.95 per month for the first student and $14.95 for each additional student. For high school students, the cost is $30 per student for each month. The high school program includes 4 courses and each additional course may be purchased for $5 each per month. You can watch demos of the program here and view the scope and sequence of each grade level here. Time4Learning includes math, language arts, social studies and science for the younger students. For high school students the program includes math, English, science, and social studies. Electives such as health and economics are also offered. There are also detailed reporting pages for parents to track progress and see quiz and lesson results. There are also teaching helps for parents and worksheets that can be printed to supplement the lessons. Language Arts – This section begins with Consonants and Short Vowels and teaches concepts such as Long Vowels, Suffixes, Long Vowels, and Digraphs. 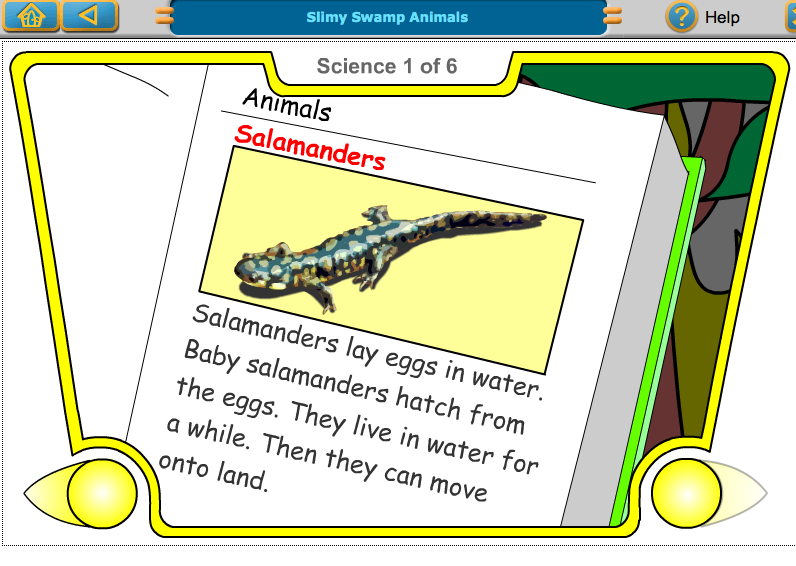 Language Arts Extensions – This program teaches the lessons learned in the language arts section in the context of different topics such as pollution, marine life, and seasons with readers and more practice. 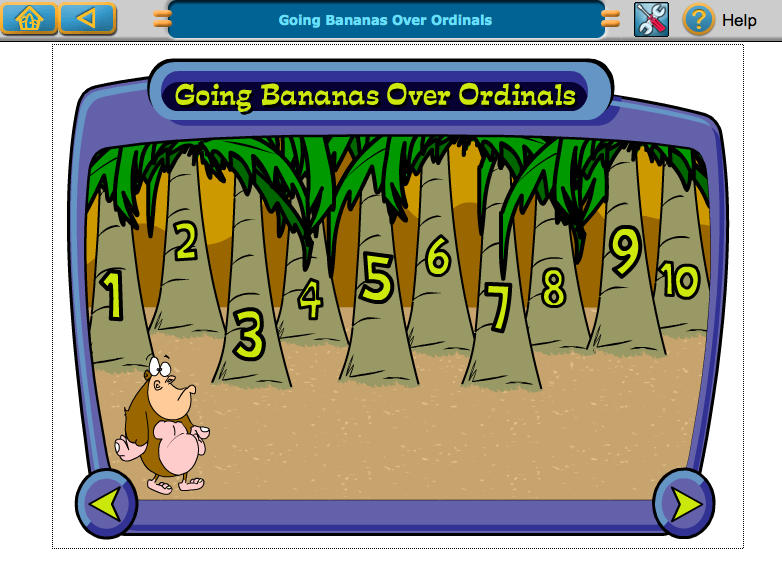 Math – The topics in this section include number sense, length, patterns, money, weight, and shapes. Social Studies – The four main sections in this category are Wants and Needs, Compare and Contrast Locations, Our National Identity, and Work in Society. 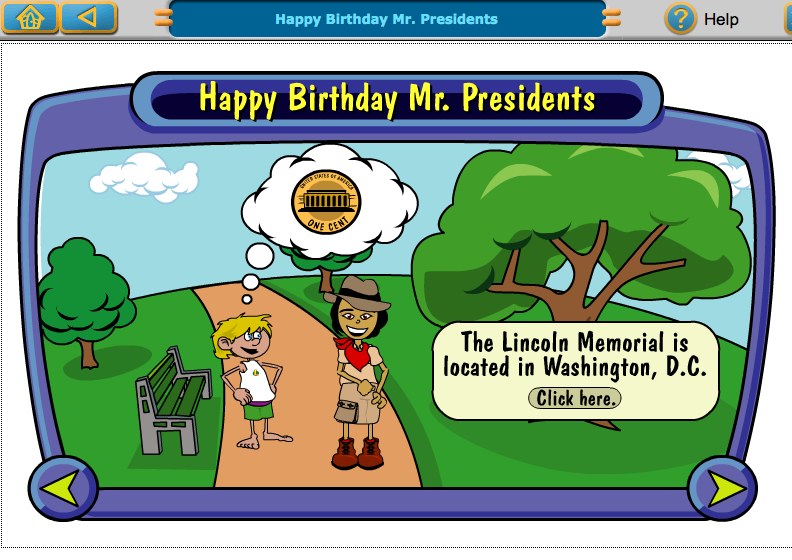 The lessons covered topics about using maps, directions, understanding wants and needs, Washington DC, and some of the monuments and landmarks in Washington DC as well as other parts of the country. Jane Goodall, and the makeup of the earth. This program was for Tiger and he was very excited to have his own online time. I will say the girls did gather around him and watched his every lesson and often “helped” him with some of the questions. I don’t think he really cared for or appreciated their help! I began Tiger on the Kindergarten level of the program. He was not enjoying this program at all and after just a few days began complaining. I sat with him through several lessons so he could show me what he was not enjoying. I quickly realized that the program was not challenging him enough and he was becoming bored with the games which were too easy for him. I switched his math and grammar over to the 1st grade level and let him begin at the beginning of those levels to see if it would be too difficult. He was able to complete these lessons independent of my help and was enjoying the program once again. With the 1st grade level comes both science and social studies as well as language extensions so he was excited that there would be more aspects to the program after viewing the K Level program. He completed several lessons a day in the language arts section, reviewing phonogram sounds and blending to make short words. 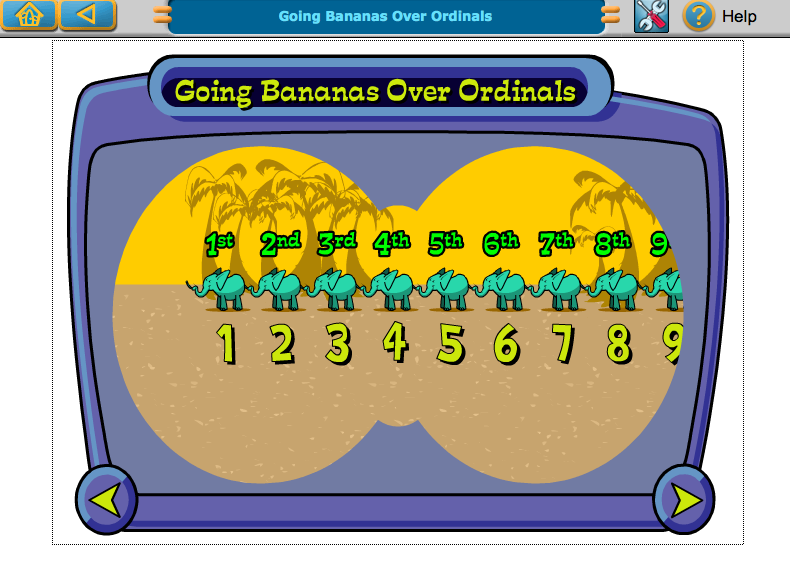 He was able to complete the math section at the rate of about 1 lesson per day as this section quickly became more challenging for him. He usually chose either science or social studies to do first before beginning his other subjects and usually completed math last since that was the most challenging for him. Tiger often worked for about 30-45 on his lessons when he had his computer time. Tiger did not use the playground area of the program even after he completed his lessons because at that time he was tired of being on the computer and was ready to do something more active. So, he felt the lessons and games within the lessons to be enough of a reward during computer time that he had no desire to try out the games. I did not need to use the games as an incentive to complete the lessons because he was already excited to complete them. So, we simply began at the beginning of the 1st grade program and I allowed him to complete 1 or 2 lessons per day during his computer time. What did a day of using this program look like? I announce that he can have computer time and all 3 big kids come rushing into the room to work on the computer. The girls sit behind him and provide a running commentary as he tries to concentrate on his lessons. His lesson was in the section about the Earth and covered the topic of thunderstorms. The lesson was introduced with a video of a chicken in a farmyard during a thunderstorm. The video explained a thunderstorm begins and what thunder is. It also included safety information about thunderstorms. At the end of the lesson there was a quiz. Curly helped Tiger read the questions and answers so he could complete the quiz. Next he chose to work on social studies. He worked on the section about maps and globes. The lesson has a video about a boy who doesn’t know the difference between a map and globe and when to use either. The video explains the differences and tells when to use each one. The video provided visuals and explained what types of things can be found on a map. Then Tiger had to select places like a lake, house, or highway and put it on the correct map – either a map of a neighborhood or a map of the United States. There was a quiz at the end of this lesson as well. Next Tiger chose to work on Language Arts. 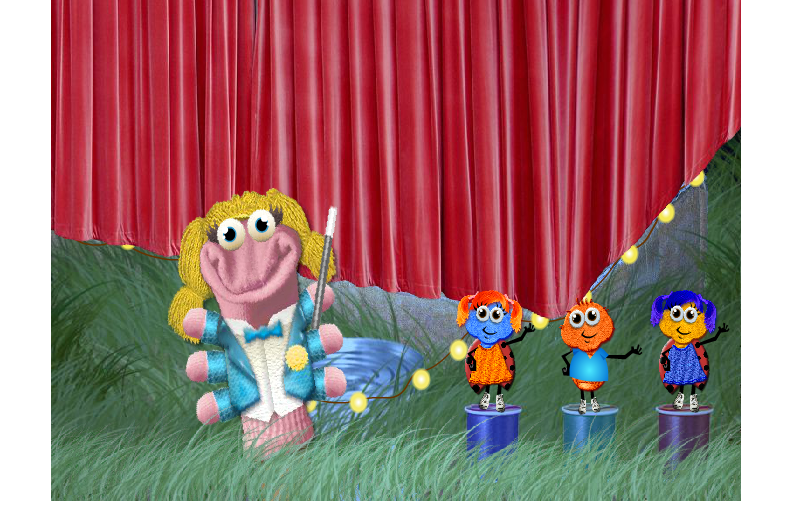 His lesson was about the sounds of “f,” “b,” “c,” and “u.” The first lesson is about some puppet bugs that are creating a band. Tiger had to chose the correct sound that he heard in order to help add members to the band. The second section had a drill sergeant puppet and he would have the other puppet cadets sound off their letter sounds and Tiger would have to choose which one made that sound. The next section had a pirate crab who had to collect high frequency words from the beach. A word would be called out and Tiger would have to use the computer arrows to guide the crab to collect the words before a large wave came to wash him away. The last section had a story for Tiger to read along to practice the sounds he had learned. Lastly, Tiger worked on 1 math section. This lesson was about fractions (halves and fourths). The lesson began with a video to teach the concept of fractions. Then Tiger had to select which pictures showed either 1/2 or 1/4. The last part of the math lesson had a quiz. This quiz was narrated for Tiger so he could complete the quiz himself. The social studies and science sections are very short and do not contain many lessons. Tiger really enjoyed these two aspects of the programs and he liked watching the short videos that went with the lessons. I found that he remembered quite a bit of the information from these sections. We were both wishing that these sections could be expanded and include more information. Tiger did not want these lessons to end and I felt that there could be more topics included. The quizzes at the end of the history and social studies section were only written quizzes and the words were not read to Tiger. He was unable to complete these quizzes on his own because he is not reading fluently. He needed me or Curly nearby to read the questions and answer choices to him. I would have preferred that these quizzes be read aloud to the student with the answer choices read aloud so the student could complete them independently. That would have allowed me to assess how well he could follow directions and if he could complete the quiz on his own. Even though Tiger did not want to use the playground area of the program, I tested out a few of the games. The playground area gives the student a 15 minute time limit for playtime each day. Once that limit has been reached the screen clears and the game or activity is ended – even if the student is in the middle of playing. This would have caused great frustration for Tiger to be cut off in the middle of a game without being able to finish. So, in retrospect, I’m glad he opted to stay in the lesson area and was not interested in additional games. Since all the lessons are online with videos and interactive lessons and games, there is a lot of screen time required for the student. While the teacher or parent can add in additional books and worksheets about each lessons, the student would still need to spend a large amount of time online to learn the difference concepts and complete the lessons. This was too much screen time for my kids since we do work to limit our screen time. Tiger enjoyed his time online but was often very ready to do something more active afterward as it required a lot of sitting for him. I found the program to be slightly on the easy side for Tiger. However, the program does allow you to adjust and change the students grade level. I was surprised that I needed to move up an entire grade level in order to challenge Tiger. So, proper placement in this program is important. Within each sections there are blinking arrows that show the student which lessons are the next to be completed. I liked that I did not have to direct Tiger where to go to complete his next lesson. He was able to log in on his own and follow the arrows to make sure he did his lessons in the correct order. 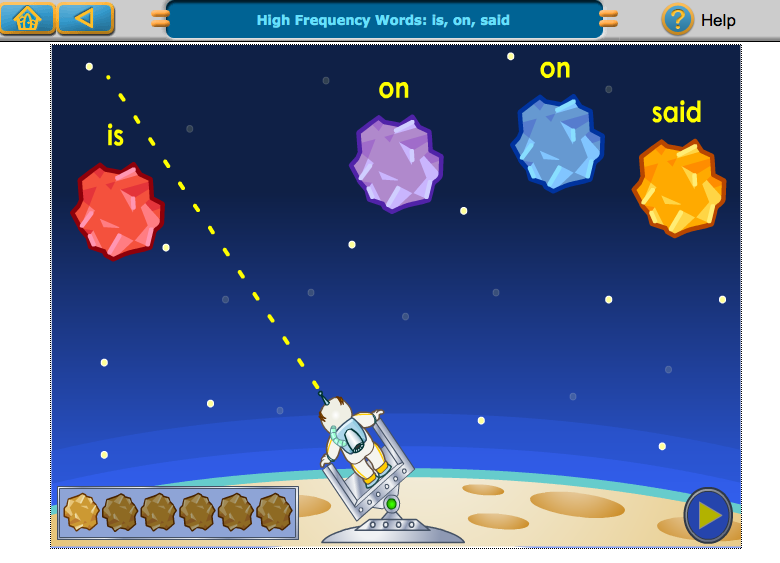 Many of the lessons had games – such as shooting a spaceman into outer space to hit the asteroid with the correct word – to practice the skills introduced in the lessons. Tiger loved these games and often played them multiple times which allowed him to practice and review the skills taught in the lesson. This meant that he had great retention of the material! The videos in the lessons were very colorful and fun to watch. Tiger enjoyed how interactive they were with places to click or characters to click on to continue the story. They held his attention well and he listened to the lessons carefully. Because most of the program has instructions that are read aloud to the student, Tiger was able to work independently. He was very proud to complete the lessons himself without my help. It also forced him to listen very carefully and follow the instructions. It was great practice for following directions. It was fun! Tiger found the program to be colorful and exciting. He loved the videos, enjoyed the characters, and loved the games. He found the lessons themselves to be a fun reward and break from our regular school day. By far, his favorite section was the language arts section which surprised me since he is struggling with reading. 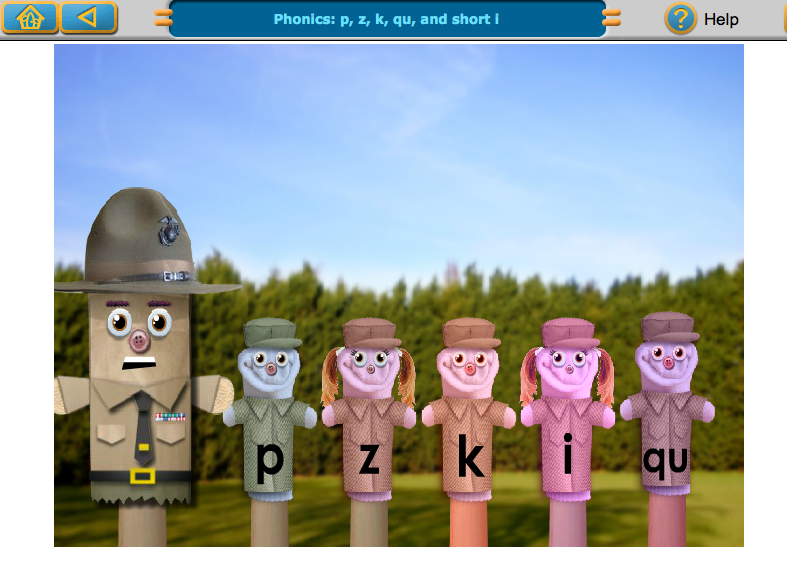 The phonics lessons were great practice and reinforcement for what we are working on in reading time. Working through these lessons raised his confidence levels and motivated him to continue working on sounding out words. Tiger really enjoyed the interactive lessons, the fun themes with puppets and colorful characters, and the games that accompanied many of the lessons. Once we placed him in the correct level he found that he enjoyed the program and liked being challenged. He looked forward to his time on the computer each day. I found that he received great reinforcement in the concepts of phonics and math. The games and the review within the sections helped him to cement his learning and keep practicing the skills that were introduced. I was pleased with the progress that he made and how well he was able to follow the instructions online. We really enjoyed this program as a supplement to our regular studies. We’re going to continue working through the 1st grade level with Tiger this semester, allowing him to keep getting good practice and review. I can see how this would be a full language arts and math curriculum with some additional practice, books, and with parental guidance. However, we found the social studies and science sections to be lacking and I would need to supplement those heavily if they were our only program – even with the suggested books and enrichment ideas from the site, we would still want more in those areas. In addition, this program requires quite a bit of screen time and since we do try to limit the amount of computer time our young children have, this program would not work well if it were done every day for the school year. Therefore, I prefer this program as a supplement to our current studies. But families who have children who thrive with online learning and interactive games will enjoy this program and could very easily adapt it to become their main curriculum with a few books and projects as supplements. Read other Crew reviews of this program here! What an incredibly thorough review. Thanks. I'm with Time4Learning but I don't look at the materials in the younger grades that often. Your copies of the screen shots reminded me how amazing the graphics are in the younger grades. I particularly like the mixed media finger puppets animations. I loved reading your review. It brought back many fond memories of my son playing with the drill sergeant and the crab. He loved that crab and would do those lessons over and over again. Thank you for the memories. We are still using time4learning as our main curriculum after 5 years now.